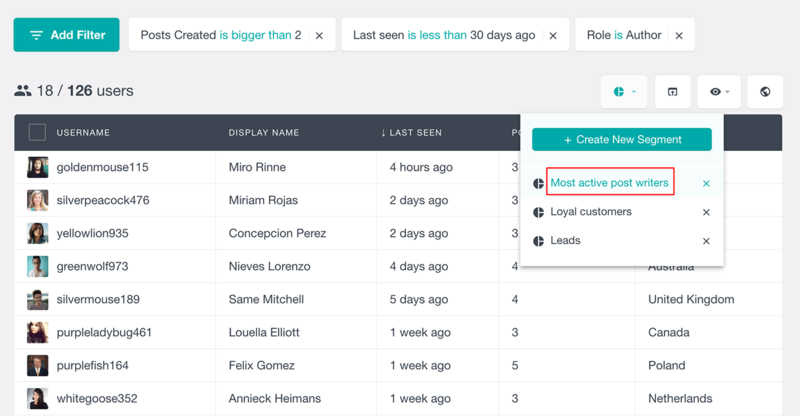 The Users Insights segments feature allows you to save a set of custom smart filters for a later instant use. This can be useful to group your WordPress users based on different criteria and later load the segmented user list with a single click. If you need to apply the same filters over and over again, the segments can make this task easier for you. Once created, the segments are available to anyone who has access to the Users Insights page, making them easy to share with your team. The main advantage of the segments is that they are dynamic and are updated automatically. This means that if a user meets the segment’s requirements at a later point, this user will be added to the segment. This is different from the user groups feature, where you need to apply the group manually every time you have new users that meet your group requirements. To create a segment, you need to have at least one filter applied. After this, just click on the “Create New Segment” button from the Segments menu. 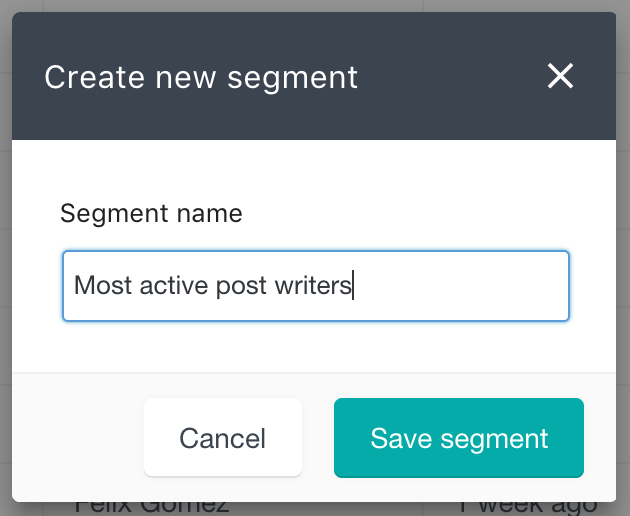 This will open a dialog that lets you enter the name of the Segment and save it. Once created, the segment will store the currently applied filters for a later use. It’s worth mentioning that the segment does not store the table column options, such as column visibility and sorting order. 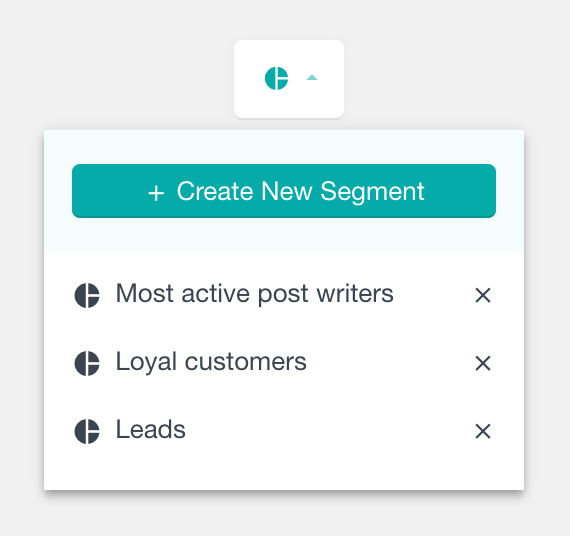 Once you create a segment, it will be available from the Segments menu. To apply the segment just click on the segment name. This will automatically load the filters from the segment. If you have some other filters applied before applying the segment, these filters would be removed first. You can delete a segment from the Segments menu. All you have to do is click on the x button next to the segment name. Just like the regular filters, you can easily export your segments. This can be useful if you want to send an email campaign to your segmented users or just keep a record of how the segment changes over time. To export a segment, make sure it is applied and then click on the Export button. The way you segment your WordPress users can depend on your business and requirements. With Users Insights you can use all of the default and 3rd party integration filters to store as segments. Here are a few examples that can give you some ideas of segments to create. User activity is one of the metrics that each user based WordPress site needs to track. The way we define user activity can vary depending on your site setup. A simple example would be to filter the WordPress users by number of sessions and time of last login. 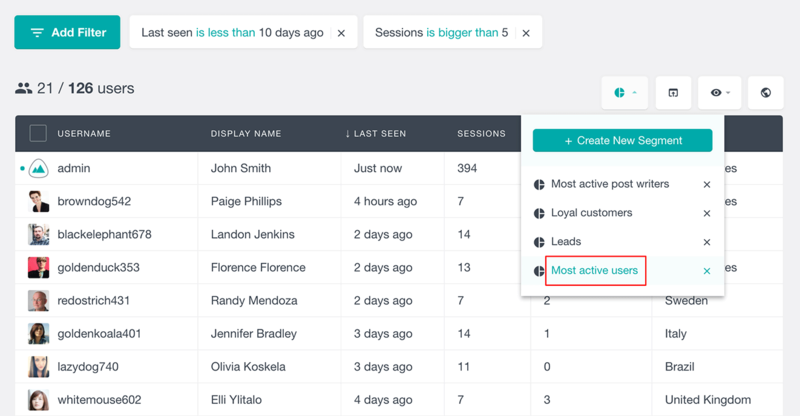 Once you have the Active Users segment created, you can apply it every now and then to see how your user activity evolves. Another example would be creating a segment of your most loyal WooCommerce customers. 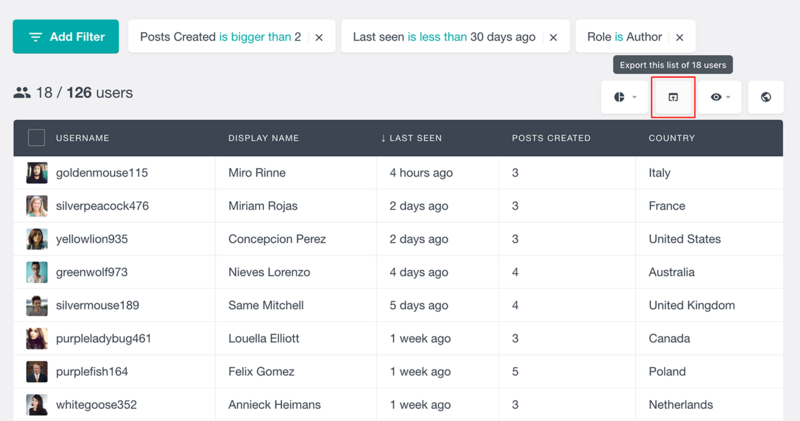 You could, for example, filter your users based on the number of orders that they have made and their status.